How To Answer the Question You Have Been Asked? In this article we will discuss on some general guidelines for answering questions that you have been asked. Sometimes when you write you can choose what you are going to write about, but most of the time you will be give something to write about. You will have a question or you will have a prompt. This is common especially common on standardized tests. 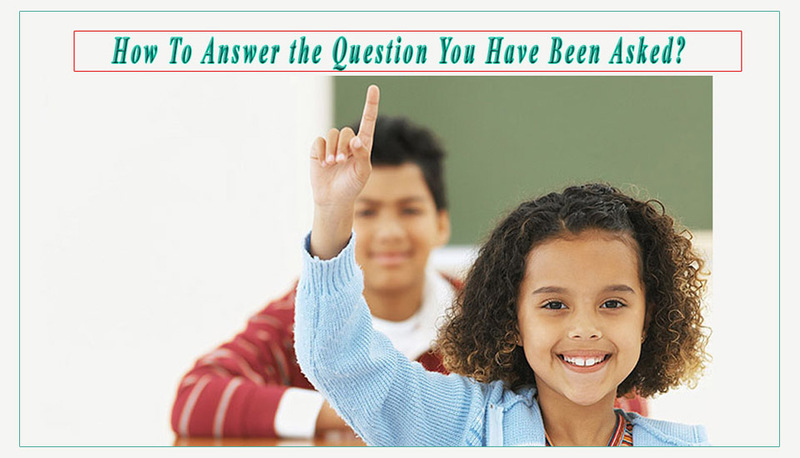 In the article below you will learn how to answer the question you have been asked. If you don’t directly address the question or prompt you will not receive any credit for your answer, no matter how well you write, because they want to make sure that you are exactly answering the question that you have been asked. So it’s very important to make sure that you understand that question and you are answering that question. 1. Read the question several times. Initially you have to read the question several times, until you are absolutely sure that you understand what you have been asked. Sometimes you might be able to ask your teacher or instructor for clarification, but other times you may not be able to, so in some standardized tests you can’t raise your hand and say you don’t understand the question, so it’s better that you understand the question on your own. 2. Look for key terms. After you read the questions once or twice depending on how many times you need, look for some key terms. For instance words like: explain, describe, analyze, classify, argue, why, why not… look for words that identify the specific task. 3. Restate the question in your own words. To make sure what you have to write about the same question, restate the question in your own words. Look for the key words, and reset the question to yourself. 4. Write a topic sentence. As you write your answer refer to the topic sentence over and over to make sure you stay on track. Remember: You must answer the question you’ve been asked in order to receive credit! This is especially true with standardized tests. That’s in part because you have been tested on your ability to answer the question. Here are the 4 most common types of questions. Recall: requires you to remember key events and facts. In this instance you are being tested and evaluated on your ability to know information. Describe how a bill becomes a law. Trace the main events in the war of 1812. Summarize the key stages in cell division. Look back at those questions. Explain, describe, trace and summarize. These are some of the words that you will see on recall questions, so when you see the words like this, you have been asked to recall specific facts. For recall questions: “Brain Dump” Quickly jot down all the facts you can remember. Doing so, you will get less nervous because you have some information in front of you. Analyze: requires you to separate something into parts, examine each part, and show how it relates to the whole. You are demonstrating here on understanding as well as recall, so you are going to have a lot of facts and details. Analyze the events in the short story by William Faulkner. Explore the cause and effects of the industrial revolution. Show why it is important to recycle. Analyze, explore and show tell you that you have analyze questions. Back to no.1 When you are analyzing the events in the short story, you are not merely summarizing and you are not going to give a short summary, instead use the plot events to show the greater meaning of the story. So you might show the theme and you might say something about the Faulkner’s work, but those details function to a larger meaning. So you are combining recall with analysis to a larger end. Evaluate: asks you to make judgments by applying a set of standards to a topic. You are also using recall and analysis, because you are using facts and analyzing their meaning. Are calculators being overemphasized in math classes? Argue yes or no. Mark Twain said, “ a classic is something that everybody wants to have read and nobody wants to read.” Give your opinion, supporting your opinion with specific details and examples. Florence Nightingale said, “You ask me why I do not write something…I think one’s feelings waste themselves in words, they ought all to be distilled into actions and into actions which bring results. “ Agree or disagree. Go back to clue words: 1. Argue yes or no. 2. Give your opinion. 3. Agree or disagree. These are the clue words that you are being asked to evaluate. As you evaluate make judgments and give examples to back those up. Would you rather be popular with an entire group without forming one close friend or have one close friend but not be a part of a group? Assume that earth is doomed and only two more people can be saved. Nominate two characters from fiction or drama. Identify why each character deserves inclusion. What are the connections between sunspots and solar weather? Explain the synthesis of art and astronomy in society. These questions rarely have the key word (synthesis), so they have to be read with extra care and you have to make sure that you fully understand the task that you are being asked. Hope the tips mentioned above on how to answer the question you have been asked were helpful. Don’t forget to write your views in the comment box below.